In compliance with OSHA regulations, Bortek is committed to maintaining the health and safety of all workers. 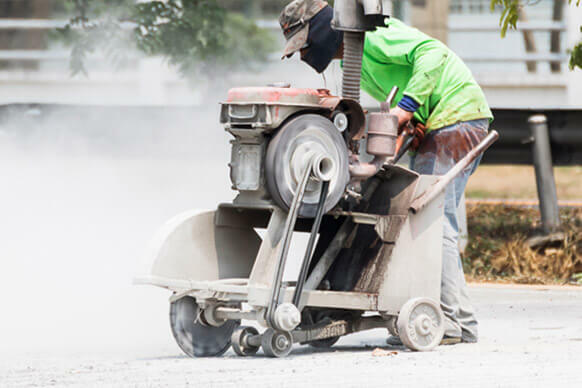 OSHA indicates that a silica dust exposure control plan includes a number of dust control measures. These measures are customized to meet every organizations needs. With a 99.9% filtration efficiency, Bortek holds our safety measures to the highest standard. When it comes to silica dust control, we've got you covered. A large number of our cleaning equipment meets and/or exceeds OSHA's standards regarding MERV-17 filtration of carcinogenic dusts. Bortek offers three types of dust control methods that can be used to support OSHA’s housekeeping practices including; wet sweeping, water flooding, and dry sweeping. Just to give you an idea of what you should keep an eye out for, browse through tabs above to see a few of those powerful cleaning machines that reach those standards! 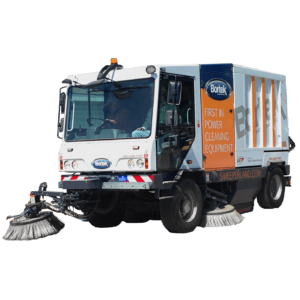 PowerBoss has MERV 17 rider sweepers that comply with the OSHA Dust Control Standards. These filtration systems on the sweeper must be 99% efficient to 0.3 micron. .03 micron at 99% efficiency requires a MERV 17 HEPA dust filter to comply. 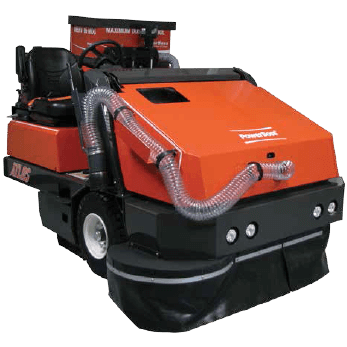 PowerBoss MDC sweepers offer a productive method of sweeping with maximum dust control. Their Atlas and Armadillo 9X Sweepers are yours to choose from! Stage 1 Vacuumized main broom chamber. 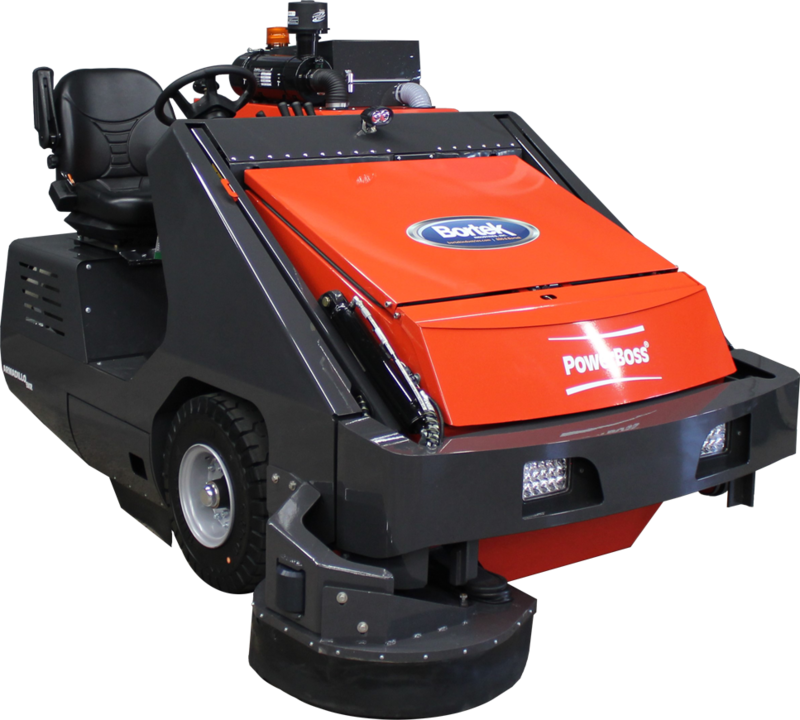 Constructed from solid steel to ensure longevity, the PowerBoss Armadillo 9X and 9XR offer a large sweep path of 64″, which can be increased to 77″ with the optional retractable dual side brooms. This optional feature is a valuable tool for wet sweeping. The PowerBoss Armadillo 9X along with the PowerBoss Armadillo 10X and PowerBoss Atlas are three of Bortek’s most effective machines for wet sweeping. The PowerBoss 9X can sweep up to 184,800 square feet per hour with this powerful machine. A large 22 cubic foot multi-level, high-dump hopper and unique Rotary Trash Locator system means that productivity is increased because more time is spent sweeping than traveling to the dump site. 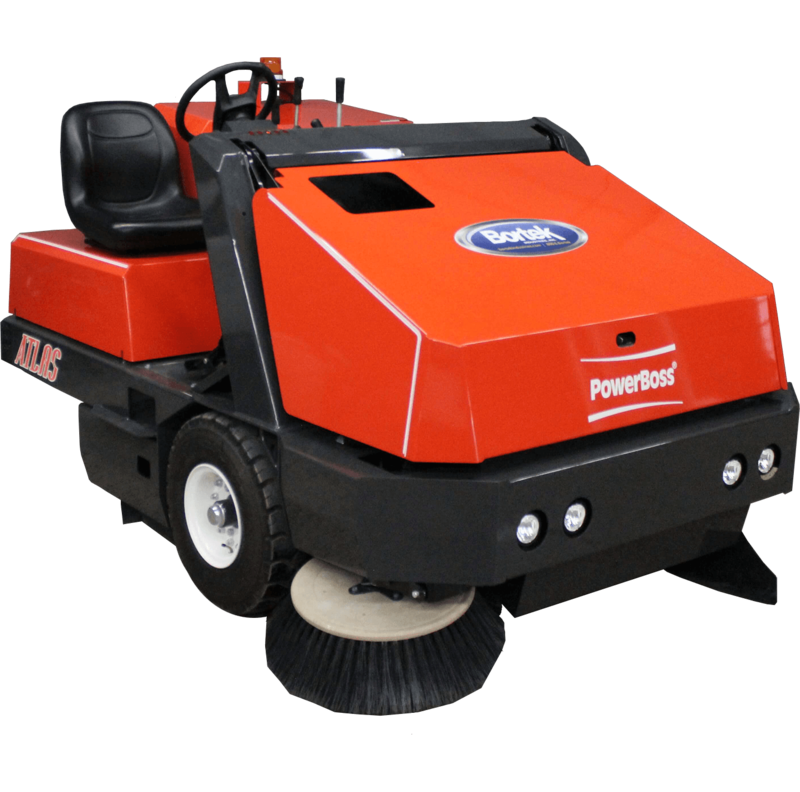 The PowerBoss Atlas delivers reliable, cost-effective performance in a maneuverable and compact package. 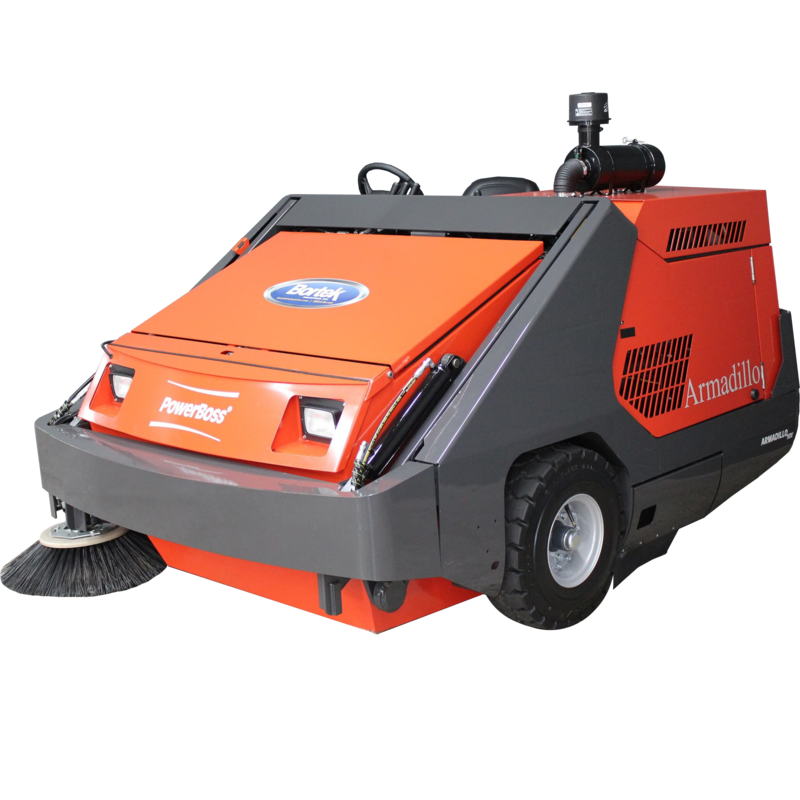 This 64″ industrial sweeper can be used indoors and outdoors in parking lots, universities, hospitals, hotels, resorts, manufacturing facilities, distribution centers and more. Using the latest, most fuel efficient engines on the market, the Atlas comes with your choice of gas/lp or diesel powered option, giving you the versatility to choose the right power source for your application. With only 83 dba noise level, this quiet machine can be utilized with little disturbance to others. By utilizing a premium hydraulic system to raise and lower the main and side brooms, the Atlas’ system is designed to be more cost-effective and reliable over the life of the machine. Adjust the main broom, side broom or dust filter easily. The side broom is also retractable, allowing the operator to swing it away from obstacles, prolonging the life of the brooms and giving you the optional wet sweeping feature for optimal dust control. A simple method using a continual water spray provides a shield of moisture on side brushes. The water not only prevents the dust from going airborne but contains it until being swept up. Thanks to its sweeping width of up to 63 inches, this powerful suction sweeper can cover over 72,000 square feet per hour and is backed with an impressive performance rating. The Dulevo 850 is one of the best cleaning solutions as it combines effective sweeping capabilities with a complete ease of maneuverability. 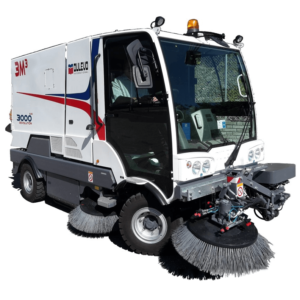 You'll be thankful to have the Dulevo 850 when maneuvering through city centers and areas difficult to reach by traditional sweepers such as sidewalks, parking garages, entry ways, pedestrian areas, warehouses, gardens etc. The wet sweeping capabilities only adds to this machines usage. Dust control has never been easier with this machine or any of the Dulevo's. Don't let the "mini" sweeper name fool you, this machine's got it all! In a nutshell, the Dulevo 3000 Revolution street sweeper is built upon an innovative design, robust constructions, effective solutions for applications, and the unique waste hopper. The Dulevo 3000 Revolution is the definition of cleaning perfection regardless of extreme weather or beautiful sunshine, it will get the job done. Don't mess around with silica dust either. The Dulevo 3000 saves up to 60% on water while meeting all expectations for dust control with the highest proofed absorption of particulates. Next to the typical operating spectrum of cleaning roads and parking lots, the 3000 is the solution that enlarges the spectrum of surface cleaning into all environments. Whether it be for municipal use, cement and steel high-dust industrial applications, power plants, or use at an airport, the 3000 is perfectly suitable for hard to reach areas due to its compact dimensions and the unique maneuverability. 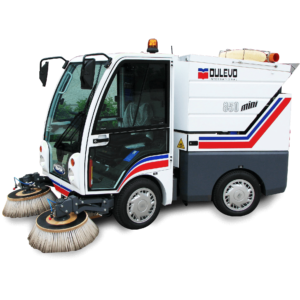 In a nutshell, the Dulevo 5000 Revolution street sweeper is built upon an innovative design, robust constructions, effective solutions for applications, and the unique waste hopper. The Dulevo 5000 Revolution is the definition of cleaning perfection regardless of extreme weather or beautiful sunshine, it will get the job done. Don't mess around with silica dust either. The Dulevo 5000 saves up to 60% on water while meeting all expectations for dust control with the highest proofed absorption of particulates. Next to the typical operating spectrum of cleaning roads and parking lots, the 5000 is the solution that enlarges the spectrum of surface cleaning into all environments. Whether it be for municipal use, cement and steel industrial, power plants, or use at an airport, the 5000 is perfectly suitable for hard to reach areas due to its compact dimensions and the unique maneuverability. In a nutshell, the Dulevo 6000 Revolution street sweeper is built upon an innovative design, robust constructions, effective solutions for applications, and the unique waste hopper. The Dulevo 6000 Revolution is the definition of cleaning perfection regardless of extreme weather or beautiful sunshine, it will get the job done. Don't mess around with silica dust either. The Dulevo 6000 saves up to 60% on water while meeting all expectations for dust control with the highest proofed absorption of particulates. 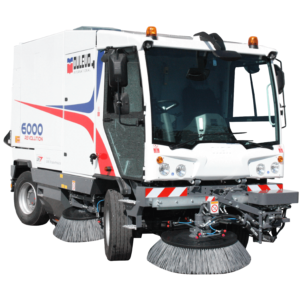 Next to the typical operating spectrum of cleaning roads and parking lots, the 6000 is the solution that enlarges the spectrum of surface cleaning into all environments. Whether it be for municipal use, cement and steel industrial, power plants, or use at an airport, the 6000 is perfectly suitable for hard to reach areas due to its compact dimensions and the unique maneuverability. The three PowerBoss Sweepers shown below combine two dust controlling methods, dry sweeping and wet sweeping. They get the optional tag from the dual and single retractable brooms located on the side of the machine. The optional wet sweeping feature makes these machines perfect for tackling any cleaning need in your work environment. Built with a heavy-equipment design criteria, the PowerBoss® Armadillo 10X is constructed to handle places where continuous sweeping is necessary. 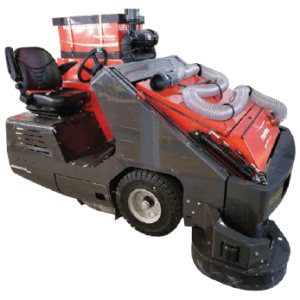 With the largest sweep path in its class, this industrial sweeper can handle airports, rail yards, amusement parks, port authorities, parking garages and countless other applications that require daily cleaning. The Armadillo 10X already is equipped with a 72″ sweep path. When a left-hand side broom is added for wet sweeping, the sweep path expands to an insane 84″, which makes it the largest in its class. In case the water sweeping method isn't a viable option for you, the water flooding method may be the way to go. As one of the most effective methods of dust control, water flooding contains the silica dust in a floor scrubber's water solution and is immediately sucked up through the recovery squeegee and vacuum. 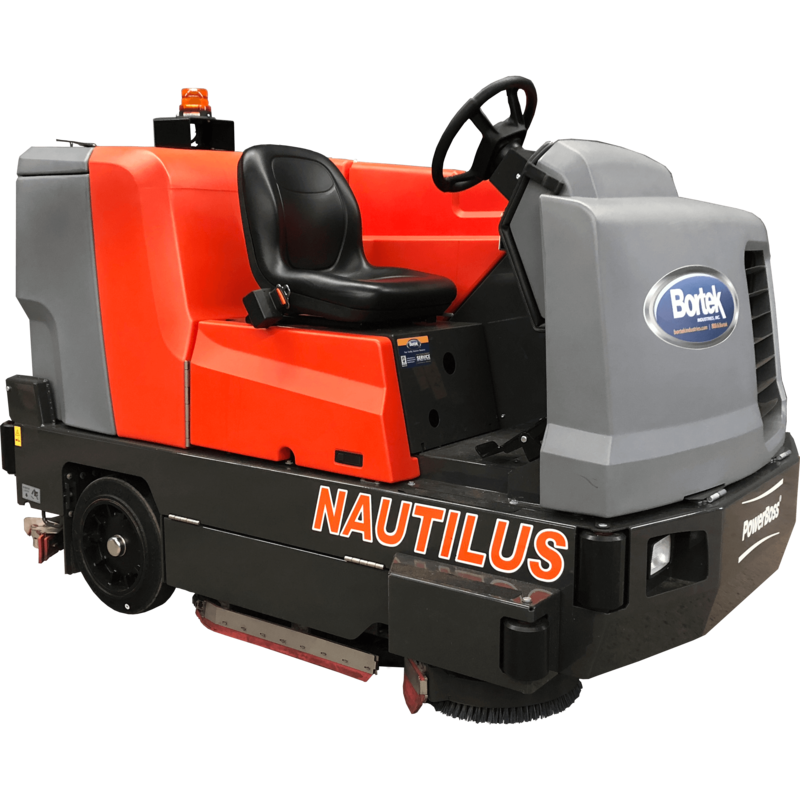 The Powerboss Nautilus is a highly maneuverable mid-size ride-on sweeper/scrubber that delivers excellent cleaning results. The large water capacity means prolonged runtime operation, so you can spend more time cleaning then refilling. The Nautilus features one switch operation that turns all the selected functions on and off. Adjust water flow and change brush pressure while the machine is running. This sweeper/scrubber utilizes the water flooding dust control method. 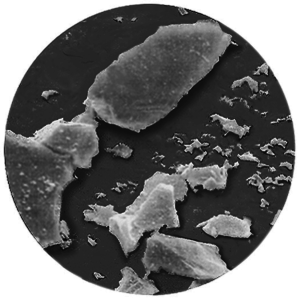 It is one of the most effective methods of silica dust control. Based on your cleaning needs, the pressure of the two Eaton hydraulic motors can be adjusted anywhere from 200 to 400 pounds. This gives you the power to remove build-up from floors and bring back the high gloss finish to dirty surfaces. An optional heavy-duty edge scrubber is available that allows the machine to clean close to walls and rack rows. In one pass, the Nautilus deep-cleans and a powerful vacuum quickly dries the surface, leaving floors immediately dry and safe for foot traffic. The PowerBoss Nautilus blow away OSHA's MERV-17 regulations! To help give you an idea of what MERV-17 means, in terms of proper filtration, we've provided this handy little MERV Chart for your convenience! 16 > 95 > 95 > 95 - 0.3-1 μm All bacteria Droplet nuclei (sneeze) Cooking oil Most smoke Insecticide dust Most face powder Most paint pigments Superior commercial buildings Hospital inpatient care General surgery Bag Filters - Non supported (flexible) microfine fiberglass or synthetic media, 12 to 36 inches deep. Box filters - Rigid style cartridge, 6 to 12 inches deep. 12 - > 80 > 90 70-75 1-3 μm Legionella Humidifier dust Lead dust Milled Flour Auto emission particles Nebulizer drops Superior residential Better commercial buildings Hospital laboratories Pleated filters - Extended surface with cotton or polyester media or both, 1 to 6 inches thick. Box Filters - Rigid style cartridge, 6 to 12 inches deep. Don’t worry about that upcoming OSHA inspection. When it comes to your construction site, warehouse and distribution center, or manufacturing plant, we are confident that our equipment will leave you virtually dust free! OSHA believes that the new regulation will save 600 lives as over 2 million workers are exposed to silica dust. For more information, see OSHA’s Final Rule. Industry Compliance Deadlines– PAST DUE– IF YOU’RE NOT COMPLIANT, CONTACT US IMMEDIATELY TO AVOID LARGE FINES!